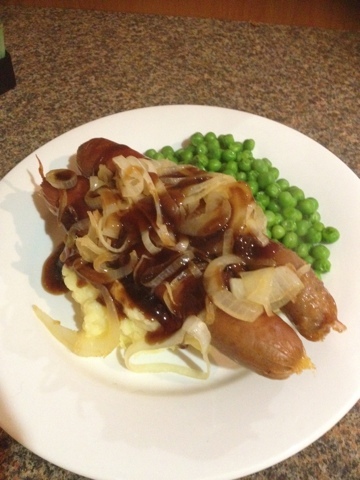 Last night I whipped up a favourite Aussie dish that many families enjoy weekly... Sausages and mash. If Australia had a cultural dish, sausages and mash would be one of the top three considerations. It is such an easy dish and one that you probably wouldn't have to go shopping for as most people would have the ingredients in their cupboard. You only need sausages (whatever kind you like. I sometimes get fancy ones but plain beef will do), potatoes, a brown onion, gravy and peas (I use frozen peas but again, whatever you like), milk and butter for the mash. Once the sausages are cooked I usually put the mash on the plate first and the sausages on the mash with the onion on the sausages and peas around the bottom so that when I drizzle the gravy/reduction over the sausages you get it on the mash as well. 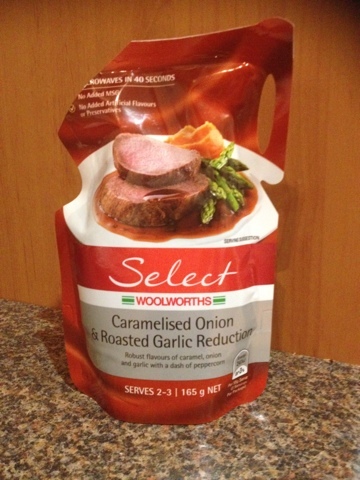 This was such a great winter dish last night and I think would go perfectly with a nice glass of peppery Shiraz.